Summary (from the back of the book): Colin Fischer just started his freshman year of high school. He has flash cards with hand-labeled facial expressions, an uncanny knowledge of genetics and classic cinema, and a tattered, dog-eared notebook that he uses to record his experiences with the "very interesting" population around him. Review: What a good read! And the cover definitely sets the tone for the book; it's a really good match for the mood and sense of humor found within the pages. I definitely recommend this one. Colin Fischer has Asberger's and has been tormented by certain classmates since kindergarten. High school isn't giving him a break from the harassment, stares and rude comments. But Colin seems to be handling it all quite well. He takes notes in his notebook, noticing details about the school and his classmates that others don't see, and he puts it all to good use when he "investigates," something Colin really likes to do. I know Colin. As a high school teacher I have taught or interacted with a number of students with Asberger's and the authors did a great job capturing Colin's speech and actions. 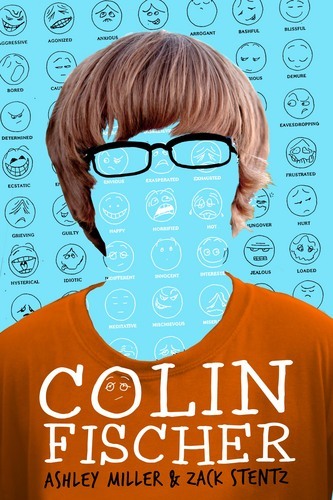 While the book is told in the third person, the reader still gets to hear Colin's thought process as he goes through his day. They also explain why Colin behaves the way he does through his thoughts, which makes the reader have a greater understanding of Colin and, in turn, people with Asberger's. I also liked the story. Something goes awry at school and the administrators/police are usually the ones who work at solving it. However, the students always seem to know what really happened. 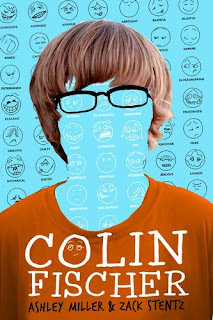 Using Colin as the "detective" allows the student perspective to come out as well as Colin's personality and the intricacies of adolescence.